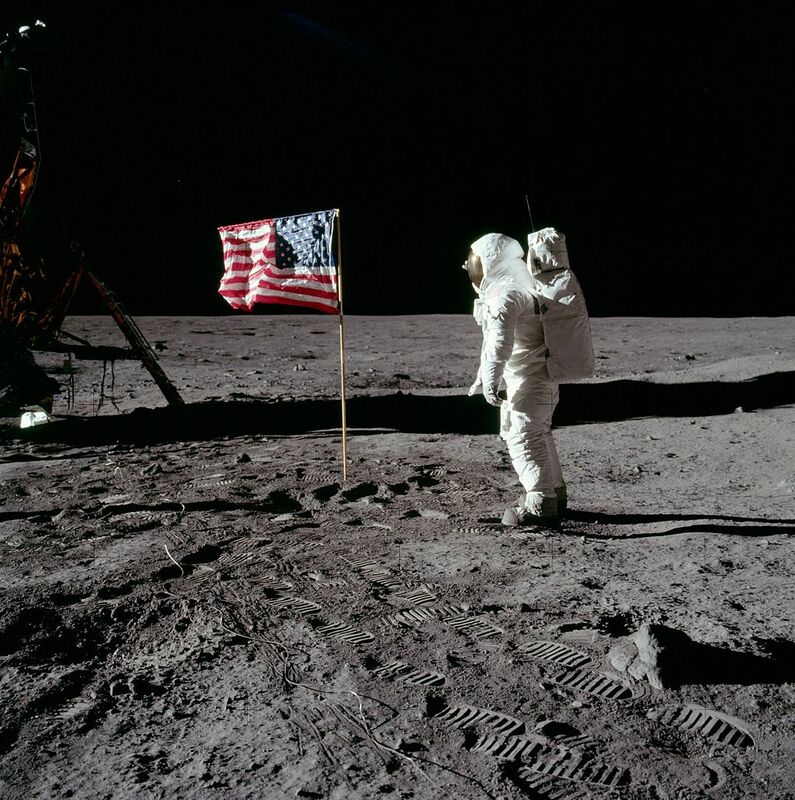 Robert N. asks: What ever happened to the flags and other things left on the moon? On July 20, 1969, Apollo 11 touched down on the moon. At 10:56 pm eastern standard time, Neil Armstrong accomplished another first. With the immortal words, “That’s one small step for a man, one giant leap for mankind,” (or something like that) Neil Armstrong became the first human to step foot on a major celestial object. Soon after, Buzz Aldrin joined Armstrong on the alien surface. The two of them spent the next two and half hours exploring, taking pictures, and collecting samples. Before they took off back to Earth, Apollo 11 left evidence of their rendezvous with the moon. 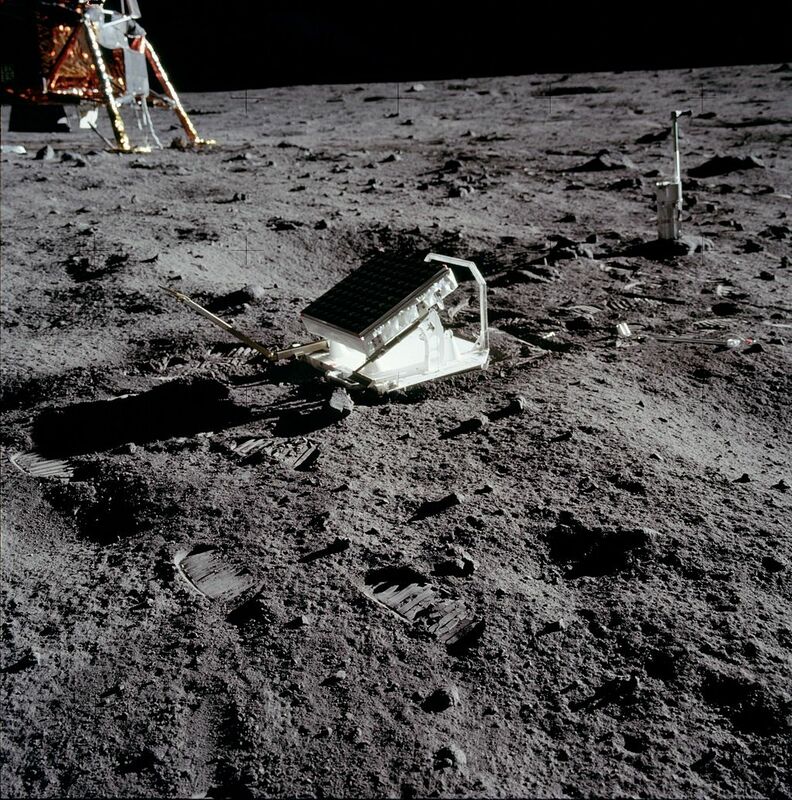 Besides Armstrong’s boot print and a bunch of junk, the astronauts also planted a three foot by five foot nylon American flag mounted on a pole into the ground. Subsequent Apollo missions that made it to the moon followed suit. But what happened to all of these flags? Are they still standing? Do they even still exist after nearly a half century on the moon? As for the Apollo 11 flag, when the engine came on and the spaceship shot up away from the moon, Aldrin said he saw the flag get knocked over by the rocket blast. Beyond that, it was thought that there would be little chance the flag would survive on the harsh environment of the moon. From the extremely abrasive lunar dust to the sun’s unfiltered ultraviolet rays, the flag most likely would quickly be bleached white and disintegrate. Five other, less talked about, flags got planted on the moon during Apollo 12, 14, 15, 16, and 17. Apollo 13 never made it to the moon because, well… they had some problems as you’re no doubt familiar. These flags were also not specially made to survive on the moon, but just ones anyone could pick up at a local store. Apollo 17, launched on December 7, 1972, featured the last humans to walk on the moon. As astronaut Eugene Cernan and geologist Harrison “Jack” Schmitt were placing the American flag into the lunar surface, Cernan apparently quipped that if he pounded the flag extra hard into the moon, that it may just last a million years. While no human has walked on the moon since 1972, plenty of crafts sent by various nations have orbited it, taking pictures as they went. As the technology advanced and the pictures became sharper, portions of the moon’s surface were seen in great detail for the first time since 1972. This brings us to 2012. The Lunar Reconnaissance Orbiter Camera, or LROC for short, was first launched in June 2009. It spent over three years orbiting the moon and taking pictures with its high-resolution camera. In 2012, images sent back by LROC confirmed that all but Apollo 11’s flag and possibly Apollo 15’s flag not only survived, but are still standing. By looking at the photos from different points in the day, the movement of shadows confirm that the flags, in some form or another, are still there. Apollo 15’s flag is still generally thought to be standing, as there is footage of this after the astronauts left. But the LROC images showed no distinctive shadow for it, as with the others confirmed still standing. That said, given the other flags seemed to have survived and it was still standing after the astronauts left, there is little reason to think this particular one disintegrated when the others did not. 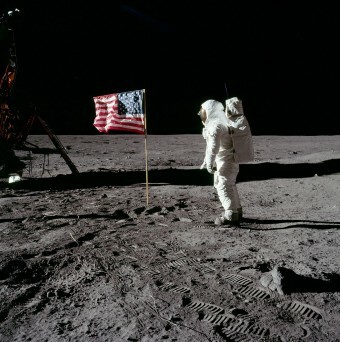 For that matter, it’s possible the Apollo 11 flag is still intact as well, simply lying on the lunar surface. So what about the condition of the flags? The general consensus is that the colors have probably faded to white. The LROC was also able to document other things left behind by the various Apollo missions, including tracks made by astronauts, backpacks, and rovers that were left. As technology progresses, we will soon be able to see the flags for ourselves to confirm the exact state, instead of relying on shadow movement. Buzz Aldrin was the first person to pee while on the surface of the Moon. Take THAT Neil Armstrong! It’s estimated that there are about 200 tons of space “trash” on the moon left by humans. This trash includes everything from high-tech lunar probes to discarded bags of astronaut urine and feces. There is also a good deal that was left there on purpose, including a golden casted olive branch from Apollo 11 and an urn of the ashes of the planetary geologist Eugene Shoemaker. They also left three retroreflector apparatuses during Apollo 11, 14, and 15. These can be used in conjunction with a laser to tell with extreme accuracy how far away the moon is at any given time. One of the other items purposely disposed of on the moon by Apollo 11 was a patch commemorating the first Apollo. During a training exercise less than a month before their launch, which was to be a low Earth orbital launch test, a fire broke out in the main cabin of the command module. The three astronauts on board, Gus Grissom, Ed White, and Roger Chaffee, were all killed. Inquiries were launched into what happened. NASA suspended manned flights for twenty months. The space program, in general, was in serious doubt. Eventually, the fire was attributed to a wide-range of design flaws in the module. I have enjoyed reading (and learning from) your RSS feeds for several months, never doubting any of the information provided – until now! The first Apollo mssion did not land on the moon on the date you have shown. The correct date is July 20 1969. Obviously a ‘typo’ but (cue for another article?) what exactly is a typo and from where did the name originate? Long may you continue with the excellent RSS feeds. Apollo 11 launched on July 16th, 1969 and landed on July 20th. Landing date wrong..July 20th …not 10th…as stated in first line of article…. @Neil Arm: Yep, thanks. Fixed! Ummm, it was July 20th , Matt. just look at the flags shadow it goes the wrong way to the rest of them. obviously the camera crew had a bulb malfunction. they should of sacked the director. or was he killed? Didn’t the astronauts leave a plaque on the moon, “We came in peace for all Mankind”? Any news on the durability of that plaque? Meanwhile, for such a momentous feat of landing on the moon (not to mention more than once) – especially if we were never to return but that a far-future generation or an alien race might discover the evidence we left – it strikes me as odd that national flags to be planted there in commemoration weren’t intended to last beyond a few decades (if that): Even if NASA were trying to cut corners for such a massive financial investment, buying flags of ordinary nylon is quite a case of penny-pinching. Here’s a question that is relatively simple, yet many articles do not discuss it. How is it these “flags” on the “moon” are flying as if they are on Earth? The moon has no air, and the gravitational pull is significantly less than the Earth. How come we have not gone back and “landed” if it was so simple? How can all this “space trash” be left on a planet whose gravitational pull is about 80% less than Earth’s? With these questions, and no valid answers, I stand on the position that this never happened. Good lord…are people still doubting the lunar landings? Dude, as has been mentioned 1 billion times (I counted), there is (clearly visible) a horizontal rod protruding from the flagpole and running through the top of the flag to hold it out. Everyone knew there was almost no atmosphere on the moon and that the flag would simply droop. The rod holds the flag out. Look at photos and film from those landings. ANYONE can see this. Now stop it. it’s nice to see so many people are now taking about it. just think that had a good mechanic to put the moon lander together. and with all that knowledge they still can’t make a good electric car these days. Funny. The flag had a rod affixed to the top. It isn’t waving, it’s trembling from the motion of being stuck in the ground. 20% gravity will still hold things to the surface unless something with greater gravity pulls them off (no wind on the moon). It’s far from easy and extremely expensive. I hope we do go back sometime within my lifetime. How could thousands of people involved and the Russians who had telescopes keep such a secret if we didn’t land on the moon? Now there’s a question with no answer. Was anything brought back from the moon landing? How come we dont talk about that? I dont believe it ever happen cause in that era people seemed to easily believe anything that was told to them, not to mention people were more prone to drug and alcohol use. Not all moon rocks were brought back on a Russian or US space craft, but experts can tell the difference between terrestrial rocks and moon rocks.